When you injure yourself, do you constantly find yourself lifting the bandage to check the wound underneath? If so, you could be introducing germs into the injury every time you peek. 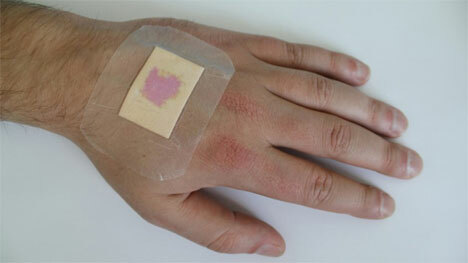 What if you could tell what was going on with your ouchies and boo-boos without making them even worse? A research team at the Fraunhofer Research Institution for Modular Solid State Technologies EMFT in Munich has come up with a wound dressing that changes color if an injury becomes infected. The bandages contain a special dye that reacts to the pH level of the skin beneath them; normal skin and non-infected wounds usually have a pH at or below 5, but infected wounds are often between 6.5 and 8.5. If the pH of the wound shifts into the danger zone, the dye in the dressing turns a bright purple, alerting the wearer to potential infection. Because the special bandage eliminates the need to constantly lift the dressing to examine the wound, the injury has a better chance to heal naturally and without interruption. See more in New Materials or under Science. November, 2010.